�REJOICE�	1987 ERICSON 34	July, 2010 LOA: 34�10�	LWL: 28�10�	BEAM: 11�4� Displacement: 13,000 lbs	Draft: 6�3�	Ballast: 5,200 lbs Engine: Universal 21 hp Diesel	Model: M3-20 3 cyl Fuel: Diesel, 21 gals, aluminum tank	Water: 72 gals, 3 aluminum tanks The ERICSON 34 offers many amenities not often found in boats her size. She is a shortened (by 6") ERICSON 35 with cruising amenities such as ample storage, 2 ice boxes, a comfortable cockpit and a private aft cabin with a quarter berth that is a true double. The 34 is a fast boat fitted with cruising amenities--a rare combination. 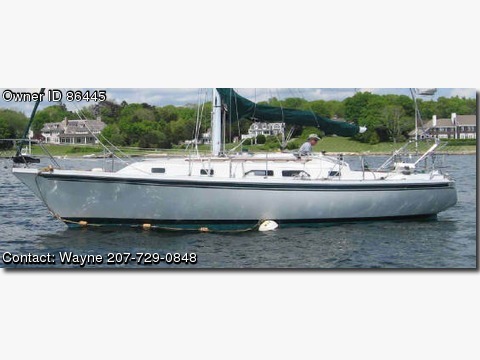 �REJOICE� was purchased by her two present owners in 2005 with the intention of sailing it indefinitely; therefore no expense was spared in upgrades and replacements. Relocation and health of one of the owners necessitate selling her. The upgrades and a superior electronic package contribute to the desirability of this ERICSON 34.